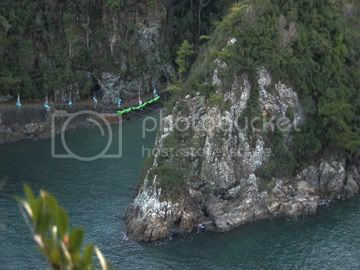 In Taiji, Japan there is a place called the cove. Surrounded by barricades and warning signs for people to keep out, this hidden location contains acts of unthinkable horror and brutality. It's from this Japanese coastal village that the rest of the world gets its supply of seemingly happy and smiling show dolphins for exploitation at places like Sea World. The ones who get put into captivity are the lucky ones as the rest that aren't selected get meaninglessly harpooned to death. Why kill them? For the meat? How so if dolphin meat contains a dangerously high amount of mercury? So, why then, do the Japanese keep slaughtering mass amounts of these innocent mammals? This is the burning question that the riveting and jarring documentary, "The Cove," addresses in a style that plays out like a thriller with intriguing craft. It's a superb piece of real-world advocacy that makes as strong of a statement for the ceasing of human destruction toward the planet as "An Inconvenient Truth," and it's a surefire Oscar nominee. Louie Psihoyos' documentary acts like a suspenseful spy movie as we are placed witness to the assembled team of environmentalists out to reveal the dark secrets behind the ways of Taiji and its treatment of dolphins. The heart of the team is Richard O'Barry whose passion comes from his origins as the original trainer of the dolphins used on the 1960s TV show "Flipper." Years after starting what became people's artificial infatuation for dolphins as the world wanted to see these animals perform circus tricks in aquariums for entertainment, O'Barry transformed into a crusader to free all dolphins held in captivity. He admits to his own ignorance during the time of "Flipper" and claims his realization came when he believed one of the dolphins he trained literally became depressed and committed suicide right in his arms. Ever since then he's been trying to make amends for what he started. For O'Barry and his team, the stakes are real and hold real-life consequences. They sneak equipment into the hidden cove to place underwater microphones and cameras hidden in fake rocks designed by Industrial Light and Magic to obtain forbidden footage. The buildup to the big reveal of the footage has a great deal of tension. Along the way, the film reveals fascinating and astonishing facts about the real reasons behind the dolphin massacres and the corruption and incompetence within the only organization that's meant to help the overall mistreatment, the International Whaling Commission. The movie is meant to enrage and rouse audiences for a call to action, and it works. When the horrifying footage is finally shown, it speaks for itself and resonates with power and importance. The climax of "The Cove" has one of the most impactive and heartbreaking scenes you're likely to see onscreen this year.